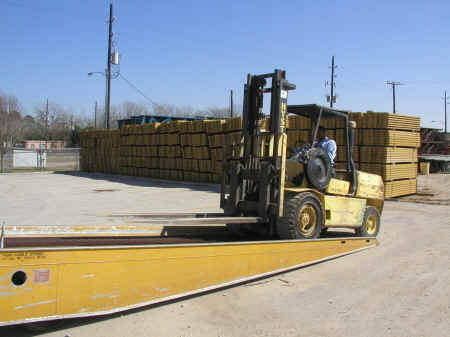 A yard ramp is primarily used to load and unload vehicle trailers, shipping containers, and other stuff without having the need to set up permanent docking bays.Yard ramps are placed at the back of the car thereby providing access for forklifts to use the ramp quick and safe into the truck body or the container itself. If your business only handles minimal amount of loads a day, then most likely yard ramps are better and cost effective choice as opposed to using permanent loading dock. What are its business advantages? Basically, a concrete loading bay is used to load and unload trucks, containers, and trailers, but of course with the help of a forklift trucks. The issue is that there are some instances wherein the loading bay is unavailable. When this situation arises, then the best thing to do is to make use of yard ramps. A yard ramp provides a perfect, fast, and efficient solution for such situations. In fact, a yard ramp can provide backup just in case there will be a problem with the existing loading bay leveler system. Yard ramps are very flexible to use. As a matter of fact, they can be used even inside and outside of buildings. There is no need for businesses to construct concrete docking bays, which could also mean better saving. A yard ramp is also suitable to use for temporary or short term sites. How to determine if your business needs yard ramp? · Your business needs yard ramp if your loading dock bay is always busy or you handle minimal loading and unloading activities. During busy days, the yard ramp can be used as a perfect alternative while yard ramp can be a perfect alternative to concrete dock bay if you are only loading and unloading one to two times in a day. There are various types of yard ramp to choose from and when making your choice, it is better to consider the capacity of the equipment to be loaded and unloaded. · How frequent your loading and unloading activities are? Yard ramps should be occasionally use and so if your business involves shift working, then most likely yard ramp does not suit your business. On the other hand, the yard ramp does not restrict the flow of load sizes required. Depending on the type of ramp you choose, you can load and unload tall and wide items without having the need to reposition them at the top of the ramp. A loading and unloading business needs varieties of tools in order to make the work significantly easier and more efficient. There are various tools to choose from, but a yard ramp is a one significant tool that has the ability to increase business efficiency. It can be beneficial for your loading and unloading business in different ways. A portable yard ramp is not only essential for small businesses, but also for medium ranged and large businesses as a whole. Angelica Shimmer is a seasoned writer with vast experience writing articles about various types of loading and unloading equipment. Yards ramps are considered the most efficient loading and unloading tools because of their ability to make tough work simpler and more functional. Angelica graduated from New York University and currently resides in Houston, Texas.